Dental exams and cleanings not only keep your smile bright, but they can also help you look and feel healthier. By sticking to regularly scheduled dental exams with Dr. Sherman, you’ll find yourself looking and feeling stronger about your smile. X-Ray Scans: Not all oral health problems can be seen on the surface. Sometimes decay, deteriorated bones and cysts can only be seen through the eyes of an x-ray scanner. We also use these scans to track any teeth movements or root issues. Gum Disease and Tooth Decay Check: These two conditions are the most common, including being the second most common diseases in the world. It’s why we take great strides to make sure that the condition is caught in the early stages, so that our Encinitas dentist can proactively treat and protect your smile. Check On Dental Restorations: If you currently possess restorations such as implants or crowns, we routinely check those to ensure that they’re in good condition. Oral Cancer Screenings: Dr. Sherman will check the soft tissues around your mouth and neck areas for signs of oral cancer. These can often show up as benign symptoms that can quickly worsen, if not treated immediately. In 2015 there were 45,780 diagnoses for oral cancer. With an approximate 5-year survival rate of 57%, it’s never been more important to get consistently examined for signs of cancer. 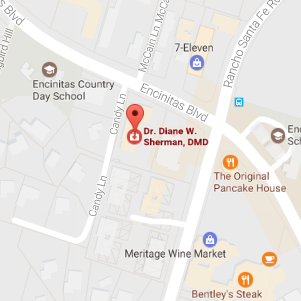 Physical Exam: Our Encinitas dentist will press against the skin and tissues around your neck and cheeks. She’ll also examine the inside of your mouth to look for red or white lesions, sores and other discolorations in your tissues. If something unusual is found, we’ll take a sample for a biopsy. If the results are positive for oral cancer, the next step will be to discuss treatments. Specialized Light: One of the best ways to detect oral cancer is to use a specialized black light on the tissues. The light changes depending on if it falls on healthy tissues or cancerous tissues, making it more obvious to find problem areas. Visiting Dr. Sherman for a hygiene cleaning is as beneficial as a health check-up with your doctor. They say that the mouth is the gateway to the body, so whatever occurs in your mouth can affect the rest of your bodily health. To reduce your risk of garnering infections and diseases, dental hygiene visits include thorough cleanings. Brushing and flossing are only one part of the cleaning process. The main goal is to clear the teeth of plaque and tartar build-up, and leave them with a new polish. Removal of Plaque and Tartar: This sticky substance is the waste byproduct of bacteria in your mouth. But this waste is also acidic and must be cleared away before it deteriorates the enamel. Flossing: These bacteria can also fester between teeth, so hygiene cleanings also include a thorough flossing. Our dental hygienists can even show you how to properly floss. Polishing: After removing plaque, the teeth are polished with brushing and may include a fluoride rinse. What Happens When You Avoid The Dentist? We understand that things happen that could prevent you from going to the dentist, but it’s not recommended to go for months or years over that six month timeline. There are some problems you may experience by not attending hygiene appointments regularly. Loose Teeth: When you neglect your dental care, the soft tissues and bone around the teeth start to deteriorate. Tooth Decay and Periodontal Disease: Tooth decay and periodontal disease are the most common oral health problems in the world! Without thorough deep cleanings, the bacteria that cause these diseases can fester. Chronic Bad Breath (Halitosis): Poor oral health and bodily conditions can lead to halitosis. A lack of dental and health check-ups allows the bacteria to infest and the halitosis to worsen. Negative Effects on Bodily Health: Studies have shown that the bacteria that cause gum disease can also lead to infection and inflammation in other parts of the body. This includes the pancreas, circulatory and respiratory systems. Stains and Discoloration: Even the best dental patients can lose track of their vices sometimes. Consuming too much coffee, wine and other darkly colored foods can leave unsightly stains and dark spots on teeth. These are deep-seated stains that often can’t be removed with simple brushing at home. Expensive Dental Treatments in the Future: If dental care is neglected for a long period of time, then it becomes more costly to fix those problems in the future. Delaying damage like cracks, chips or infections will require more complex and expensive treatments. Since tooth decay is often the main culprit behind a patient’s poor oral health, it’s important to understand how it forms. Bacteria is all around you, and the ones that make it to your mouth are often benign or washed away by your saliva. But with a lack of dental care or a dry mouth condition, these bacteria can make a home on your teeth and gums. These bacteria that are left behind consume leftover food particles and dispense acid waste in the form of plaque. The plaque is a sticky substance too, and slowly erodes the enamel on the surface of your teeth. As the enamel reduces, plaque builds into tartar and leaves dark stains and cracks on the tooth crown. The cracks can extend into the pulp of the tooth, where the blood vessels and nerve endings reside. The decay causes great pain and sensitivity, making biting and chewing uncomfortable. Untreated tooth decay can deteriorate teeth to a point where they can’t be treated, and patients must resort to more drastic treatments. This may include tooth extractions and replacements, such as dentures or bridges. Schedule your Next Cleaning & Exam Today! Hygiene appointments with our dentist in Encinitas should be made every six months. We’ll take care of your dental concerns and ensure that you walk out with a fresh and strong smile. Don’t hesitate to contact us to make an appointment today.